Established in 2010, the Scottish Political Archive is a project based in the university's History and Politics Department, which aims to collect material relating to modern Scottish politicians and political organisations through oral history interviews and the donation of political papers and memorabilia to the project. The archive is part of a larger project on Scottish politics and the devolution referendums of 1979 and 1997 and the forthcoming 2014 independence referendum. Material collected by the Scottish Political Archive to date includes: oral history interviews with politicians and activists involved in the 1979 and 1997 devolution referendums; the Scots Independent Newspaper photograph collection, recording politicians and political campaigns from the 1960 to the present; the Bruce Watson collection of political pamphlets and memorabilia (Watson was Chair of the Scottish National Party from 1945-1947); material relating to the political careers of Dennis Canavan (1974-2007); George Foulkes (1975-1997); John McAllion (1988-1997); George Robertson (1965-1998) and Gordon Wilson (1962-2000). Full details of the material catalogued to date (November 2012) can be found on the online archives catalogue. Access: Access to the collection is currently limited as the material is currently being catalogued. Poster for the Scottish Political Archives Democracy for Scotland exhibition which has visited Edinburgh, Stirling, Aberdeen and Dumfries in 2012. 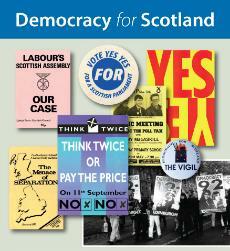 News, articles, and updates on the work of the Scottish Political Archive. Images from the Scottish Political Archive collections.